The Milliard Truck Tent is the perfect accessory to upgrade your camping experience. The strong ripstop grade material is made to last through many many years of fun and adventure, and the simple setup means you can have your tent up in a snap. The tent has a sewn in floor which goes over the bed of your truck, so say goodbye to dirt and mud, all is clean and cozy in the tent! The lantern hook makes it easy to add light and the interior storage pocket is a great place to store your wallet, books, phone, and other small accessories. We added mesh ventilation screens on the door and windows so you can get all the fresh air you need, and privacy closures on the windows can be closed as well for more peace and quiet. EASY- Setup is simple and quick with our clear instruction manual, and the carry case makes travel easy. COMFORTABLE- The sewn in floor means dirt from your truck bed won’t get into the tent and a rainfly is included for use in wet conditions. PRIVATE – The mesh door and windows feature privacy shades so you can sleep in peace. UPGRADED – The superior ripstop grade material is super durable and long-lasting, plus the tent features a lantern hook and inside storage pocket to enhance your night out. 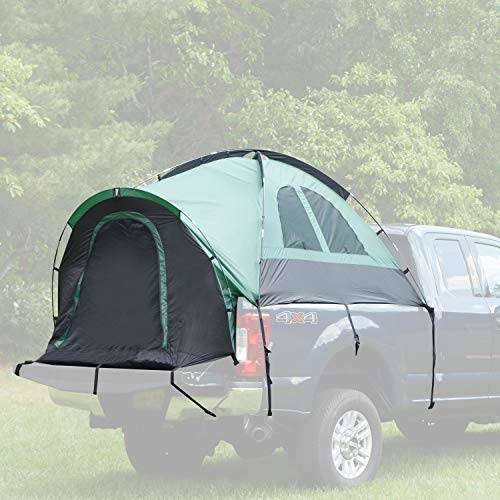 SIZE – This tent is designed to fit a standard 6.5ft truck bed. Measure your bed with the tailgate closed.